Introducing the newest in doorstop design. 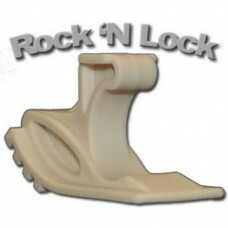 The stylish and functional Rock’N Lock Doorstop. No need to force this doorstop into position. It works with the door, rocking into position and will not move until you move it. Standing just over 2" high and 3" in length, this newest addition to the doorstop market is “Rocking" over the competition. Made of Santoprene rubber this doorstop will not get stuck, slip or damage your door or floor.